Use Le Chatelier’s principle to determine if an electrolytic/voltaic cell will be more or less spontaneous. Be able to quantify what happens to the anode and cathode (in terms of mass and concentration) in an electrochemical reaction. Be able to manipulate an electrochemical cell to achieve a desired voltage. Electrochemistry is the study of the relationships between chemical reactions and electricity. The functionality of every portable electronic device you own, whether it be your laptop, Ipod, or cell phone, is made possible by electrochemical reactions. Fundamental oxidation/reduction reactions occur inside the batteries of these devices. Chemists and engineers all over the world are searching for ways to improve the technology by developing materials which will make the batteries for these devices cheaper, more lightweight, and longer lasting. Electrochemical reactions can be spontaneous or non-spontaneous. We will build on the principles we learned from the thermodynamics unit to determine if an electrochemical process is spontaneous. If it is not, we will learn how to manipulate electrochemical reactions to make them spontaneous. Section 4.4 in the Brown/LeMay/Bursten/Murphy textbook (pg 135) briefly covers oxidation-reduction reactions. This section introduced the concept of oxidation (loss of electrons) and reduction (gain of electrons), and set up bookkeeping rules in order to determine the oxidation number, or oxidation state, of a particular atom, ion, or molecule. Chemists are not satisfied with simply observing physical processes. They want to be able to predict and manipulate them. The Activity Series, which is shown below, arranges metals in order of decreasing ease of oxidation and allows the chemist to predict the outcome of reactions between metals. 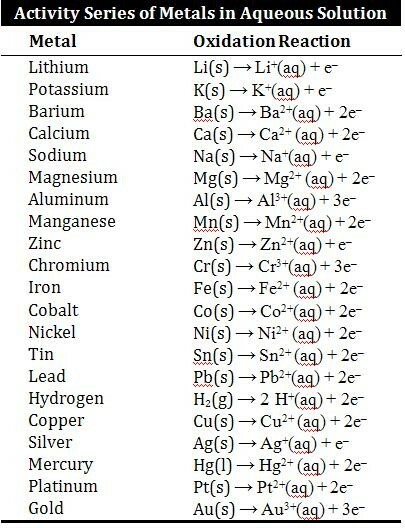 Simply put, any metal can be oxidized by the ions of the elements below it. That’s pretty much how we left everything in Chemistry 121, but we can now apply newly learned concepts, such as whether a reaction is spontaneous, and use this more in depth knowledge to make more sense of the statement “any metal can be oxidized by the ions of the elements below it.” We will also give numerical values, or reduction potentials, to each half reaction, which will enable us to calculate the voltage produced by these redox reactions. NOTE: You are highly encouraged to work in groups on the Example Problems, but must perform all chemical experiments individually. Example 2. In the procedure outlined below you are instructed to clean all of the electrodes. For Cu, Sn, and Fe you will use HCl to clean them, but in the case of Pb you must use HNO3 instead. Why is this the case? 1. The electrochemical apparatus for this experiment is available at the storeroom window. In order to check one out you must present your BuckID or drivers license. 2. Obtain a porous cup from your TA and place it in a clean 100-mL beaker. Fill the beaker roughly ¾ of the way with distilled water and fill the cup with 3 M nitric acid. Allow the cup to soak while you work on the next example problems. Example 3. Figure 20.5 on page 852 of the textbook describes the voltaic cell in which zinc metal is in contact with Zn2+ solution and copper metal is in contact with Cu2+ solution. A similar figure is shown below. Indicate the half reaction occurring at the anode and cathode and label each of them. Show the direction of electron flow, and the identify the ions present in each solution. Although this figure is very commonly used in textbooks and is the way electrochemical cells are drawn in lecture, it is different than that set-up we will be using in lab. For a voltaic cell to function properly, the two half-cells must be electrically neutral. In order to maintain neutrality a salt bridge is typically used. 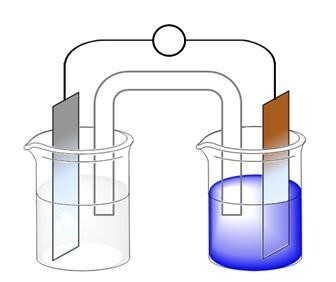 Instead of a salt bridge, we will be using a porous cup, which separates the anode and cathode compartments and at the same time allows migration of ions to complete the circuit. Before we set up this voltaic cell, each electrode needs to be cleaned so it will function properly. 3. Your TA will have a box with all of the electrodes you will need for this experiment up at their lab station and all solutions can be found on the cart. 4. To prepare each electrode you must wash them with acid. If you are instructed to use a Cu, Sn, or Fe electrode, add about 20 mL of 3 M HCl to a 75-mL test tube. Immerse the electrode into the test tube and gently shake it for a few minutes. You can dispose the acid by dumping it down the drain. You will need to rinse the electrode by filling up the test tube half way with water. After it is rinsed, dump out the water and dry off the electrode with a Kimwipe. Your electrode is now good to go. If you are instructed to use Pb as an electrode, you will use a similar procedure, except you will need to use 3 M HNO3 instead of HCl and the acid wash must be properly disposed in the inorganic waste beaker. If you are using a Mg or Zn electrode add roughly 1 mL of 3 M HNO3 to a 25-mL test tube then fill it up with distilled water. Immerse the electrodes for about 5 seconds, rinse with distilled water, and blot them dry with a Kimwipe. The rinse solution for the Mg and Zn can be disposed down the drain. 5. Dump the contents from the porous cup and the beaker down the drain, rinse the porous cup with water, and shake them both to remove as much excess water as you can. 6. Set up your voltaic cell by placing the porous cup in the 100-mL beaker, then fill up the beaker with 1 M CuSO4 solution. Fill up the porous cup with 1 M ZnSO4, then place the zinc electrode in the ZnSO4 solution and the copper electrode in the CuSO4 solution. 7. Now we are at the point where we can measure the potential difference. In order to do this you will be using a Fluke 175 Mutimeter, which you will need to connect properly. On the front panel of the Multimeter plug the black wire into the common ground (COM) position and the red wire into the voltage (V) position. Obtain some emery paper from your TA and sand the inside of both alligator clips. 8. Attach the alligator clip connected to the black wire to the zinc electrode and the alligator clip attached to the red wire to the copper electrode. Turn the knob on the Multimeter to DC volts, which is indicated by a straight line above a dotted line on top of the capital letter V.
Step 9 shows how the read out on the multimeter changes when the lead wires are interchanged. 9. After about 30 seconds record the voltage in your lab notebook. Switch the alligator clips on the zinc and copper electrodes and note any changes that take place in the voltage reading in your lab notebook. 10. Switch the alligator clips back to the setup from step 8 and let the reaction proceed while you complete the following exercises. Sketch the cell similar to the way it is shown in the text and notes and be sure to indicate: the cell potential for each half reaction, the anode/cathode, the overall cell reaction, the overall cell potential, and which direction the electrons are flowing. What do you predict the reading on the Voltmeter to be? Show this prediction to your TA. 11. Remove the porous cup with the zinc electrode from the beaker and detach the alligator clip. Dump the solution in the cup down the drain and rinse off the electrode. Give the zinc electrode back to your TA and exchange it for a tin electrode. 12. Using distilled water, rinse the porous cup and fill it with tin(II) chloride solution. Place the tin electrode in the cup and attach the alligator clip attached to the black wire plugged into the COM port of the voltmeter. Place the porous cup in the beaker, wait for about 30 seconds, then record the voltage. 13. Is the theoretical voltage from Example 5 consistent with the experimentally determined value? 14. Repeat the same experimental procedure you used for the voltaic cells from Examples 3 and 4 to experimentally determine the voltage for all three cells in Example 5. You may do these trials in any order you wish depending on which electrodes your TA has available. What voltage reading do you expect from this cell? How could you modify the conditions to achieve a positive voltage reading? 15. Once you have completed steps 1 – 14, find a partner to complete steps 15 – 20. In these steps you will investigate the effect varying the concentration has on the cell potential. This relationship is referred to as the Nerst equation. Steps #15-20 of this lab illustrate this and can be observed in the video below. 16. Using 1 M CuSO4 prepare 100 mL of 0.10 M and 0.010 M CuSO4 solutions. 17. Fill a clean 100-mL beaker and the porous cup with 1 M CuSO4 solution. Place the porous cup inside the beaker and place a copper electrode in both the beaker and the cup. 18. Plug the black wire into the COM port of the voltmeter and connect its alligator clip to the copper electrode inside the porous cup. Plug the red wire into the V port of the voltmeter and connect its alligator clip to the copper electrode in the beaker. 19. Be sure the dial on the voltmeter is set to DC Volts and after 30 seconds record the voltage. Does this voltage reading make sense? Why or why not? 20. Now to study the effect of concentration we are going to observe the voltage for the 0.10 M and 0.010 M solutions of CuSO4. Dispose of the 1 M solution in the porous cup and fill the cup with the 0.10 M CuSO4 solution. After about 30 seconds, what happens to the voltage? Repeat the same thing for the 0.010 M CuSO4 solution. Example 7. Write out an equilibrium expression for the overall cell reaction in Example 7. Using Le’Chatelier’s principle show the effect on the equilibrium by decreasing the concentration of Cu2+ at the anode. Does this increase or decrease the Ecell? Does this make the overall reaction more or less spontaneous? Why? What effect would increasing the concentration of Cu2+ have on the equilibrium and spontaneity of the cell reaction? Pb2+(aq) + 2 e− → Pb(s). Cu2+(aq) + Pb(s) ↔ Cu(s) + Pb2+(aq). What effect does adding NH3 have on the concentration of Cu2+(aq) and Pb2+(aq)? How will this effect the Ecell of the overall reaction? By adding NH3 will the reaction be more or less spontaneous? Why? 21. Properly dispose of all copper solutions by dumping them in the sink. Remove and clean all electrodes and give them back to your TA. When you are finished with your experiment, place all the electrical equipment back in the plastic storage container and return it to the stock room. 22. Now that you have completed the analysis of a voltaic cell, which happens spontaneously, we will investigate an electrolytic cell, which is a nonspontaneous process. We discussed voltaic and electrolytic cells in class. A Voltaic Cell is a device in which chemical energy is changed into electrical energy via a redox process, which you investigated in steps 1 – 22. Remember that we defined a spontaneous process as one that proceeds on its own without any outside intervention. In an Electrolytic Cell, electrical energy is changed into chemical energy with the use of a current to force a chemical reaction. If you read through the entire procedure, one fundamental difference between and voltaic and electrolytic cell is that you do not plug in the electrochemical apparatus for the voltaic cell measurements, but you do plug it in for the electrolytic cell experiments. This tells us that in a voltaic cell we can get electrical energy from chemical energy and the process is spontaneous. On the other hand, an electrolytic cell uses electrical energy to make a nonspontaneous process proceed forward, producing a chemical change. 23. The electrochemical apparatus for this experiment is available at the storeroom window. In order to check one out you must present your BuckID or drivers license. 24. Your TA will assign you an electrochemical cell and give you your assigned electrodes and a porous cup. 25. Repeat Steps 2 and 4 to prepare the porous cup and electrode for your experiment. 26. Weigh each electrode to the nearest 0.0001 g and record each mass in your lab notebook. 27. After you properly prepare the electrodes and the porous cup, fill a 100-mL beaker with the cathode solution. Sand the alligator clip connected to the black wire, attach it to the cathode and place it in the beaker. Fill the porous cup with the anode solution and sand the alligator clip connected to the red wire, attach it to the anode and place it in the porous cup. 28. Plug the power supply box into the Multimeter by inserting the pins on the back of the power supply into the upper left/lower right holes on the Multimeter. 29. Plug the power adapter into an electrical outlet and before you turn on the Multimeter have your TA check your setup. The electrolytic cell for the electrodes given to you by your TA is observed in steps 30-31, which are seen in the video below. 30. Adjust the knob on the Multimeter to the mA position and turn the current switch to the on position. Hit the yellow button to select the DC setting and adjust the current setting knob to read as close to 75 mA as possible. It could take up to 30 seconds to stabilize the initial reading. 31. Make a table in your lab notebook and take 15 readings at two minute intervals for a total electrolysis time of 30 minutes. Be sure to adjust the current to give readings as close to 75 mA as possible. Example 9. For your assigned electrolysis solution draw the electrolytic cell and at each electrode show how the mass of the solid will increase/decrease or if the concentrations of the ions in solution will increase/decrease. Be sure your drawing indicates what is going on at the atomic level. Example 11. Predict which metal electrode should weigh more and which one should weigh less for your assigned electrode solutions. Give this prediction to your TA before you complete steps 34 –42 in the procedure. 32. After you collect readings for 30 minutes turn off the Multimeter and carefully disconnect the alligator clips. 33. In the electrochemical cell the anode is being oxidized and the cathode is being reduced. This will change the mass of the anode and the cathode so you need to be careful when handling each electrode. 34. Rinse off the anode with distilled water then with acetone and set it aside to dry. 35. Weigh a clean, dry watch glass and record its mass in your lab notebook. 36. Carefully place the cathode on the watch glass and rinse it twice with water. After each rinse, use a micropipet to carefully remove as much water as possible. Note: you do not want to remove any solid. 37. Rinse the cathode twice with acetone. Again, remove as much acetone as possible with a micropipet without removing any solid. Set the watch glass containing the cathode off to the side to dry. 38. While you are waiting for the electrodes to dry, add 3 M nitric acid to the porous cup and let it soak for about 5 minutes and dispose of all the solutions. All the zinc and lead solutions must be placed in the inorganic waste container. Everything else can be washed down the drain. 39. Weigh the electrodes on the analytical balance and record their masses in your lab notebook. 40. Dispose the nitric acid in the porous cup down the drain and rinse it out. Rinse and dry all your electrodes and return the porous cup and electrodes to your TA. 41. Neatly place all electrical equipment back in the plastic storage container and give it back to the storeroom window. 42. There will be a lab practical assignment based on the principles and example problems of the first two electrochemistry lab periods. You will complete the practical in groups of four during the next lab period. 43. Before you leave get your TA to sign off on your Example problems and data collection in your lab manual and hand them the carbon copies before you leave. 44. There is a Mastering Chemistry report questions assignment for this lab. Check on-line and with your TA for the due date. No late assignments will be accepted.